The United States had the manpower and the willingness to fight in World War II. It had the industry and ingenuity to create overpowering weapons, the fleets and squadrons to fight on both the European and Pacific fronts and the strategic prowess to grind out victories alongside its Allies. Still, the troops—mostly young men—who would be fighting were going to get stressed. They were going to be bored for long stretches. They were going to get lonely. And even if they did have entertainment options, they weren’t going to have lot of money to spend on them. American might could help win the war, assuming the spirits of America’s troops didn’t break. “You see them near forts and camps, spread out along the highways in dejected groups, eager for sport and civilian contact, with none to be had,” reporter Meyer Berger wrote in The New York Times in the spring of 1941, as the peacetime draft instituted a year earlier had swelled the military’s ranks in preparation for war. Ad hoc military support groups had popped up throughout America’s wars, but nothing like what started brewing in October 1940. The USO dispatched its mobile centers to remote sites so troops in the field could enjoy their limited downtime. Thanks to these vehicles, American service men training in Panama in the early 1940s had some entertainment options. Fourteen months before the attack on Pearl Harbor and official declaration of war by the United States, representatives from a sextet of social welfare organizations started meeting informally in New York City. Coordinated by Frank Weil, then the head of the National Jewish Welfare Board, the groups that had individually provided services to troops during World War I were concerned what would happen if the next generation of American warfighters deployed en masse to fight the Axis powers. Those gatherings led to a January 1941 meeting with President Franklin Delano Roosevelt and military brass. According to “Always Home: 50 Years of the USO,” Roosevelt was concerned with keeping troop morale as high as possible throughout the pending conflict. While military leaders wanted total control of the morale effort, Roosevelt solved the operations issues with a decree: The newly formed USO would handle “on-leave recreation of the men in the armed forces” and would operate separate from military control. The United States government would supply the buildings where it could—building some from scratch. Your donations help the USO connect America’s deployed service members around the world to their families back home. On February 4, 1941, the Salvation Army, YMCA, YWCA, National Catholic Community Services, National Travelers Aid Association and National Jewish Welfare Board officially pooled their resources and incorporated a new standalone nonprofit—the United Service Organizations—in New York. Its mission was clear: keep morale high during what could be the darkest period of these troops’ lives. But no one knew what was coming next. The words of USO Hollywood Canteen junior hostess Nancy Brown—as quoted in Meghan K. Winchell’s book “Good Girls, Good Guys, Good Fun"—were the ethos of USO junior hostesses during World War II. As USO clubs popped up across America in buildings, train stations and even abandoned barns, tens of thousands of volunteers signed up to support the war effort, not with guns or industrial grit, but with wit, courtesy and dancing shoes. By November 1941, the first permanent USO building—which the USO still operates today—was constructed in Fayetteville, North Carolina, to serve Fort Bragg. And by the height of America’s involvement in World War II, more than 3,000 USO clubs dotted the globe, with an estimated 1.5 million volunteers helping out during the conflict. Those volunteers—specifically senior and junior hostesses—were the women who brought USO clubs to life. The clubs were conceived as homes for good, clean fun and relaxation. But beyond the general spirit-lifting mission, each club was left largely to set its own rules of operation. While nuances abounded, many fell into a general pattern of being led by senior hostesses—often married women over the age of 35 with some standing in the community—who coordinated the constant flow of meals, social services and dances at the club. Meanwhile, junior hostesses often stole the show. The young, single women—who had to adhere to a strict set of rules that included no drinking on the job and no fraternizing with the service men outside the club (though the latter rule wasn’t always followed)—became de facto mascots of the organization that rivaled Bob Hope at the time. 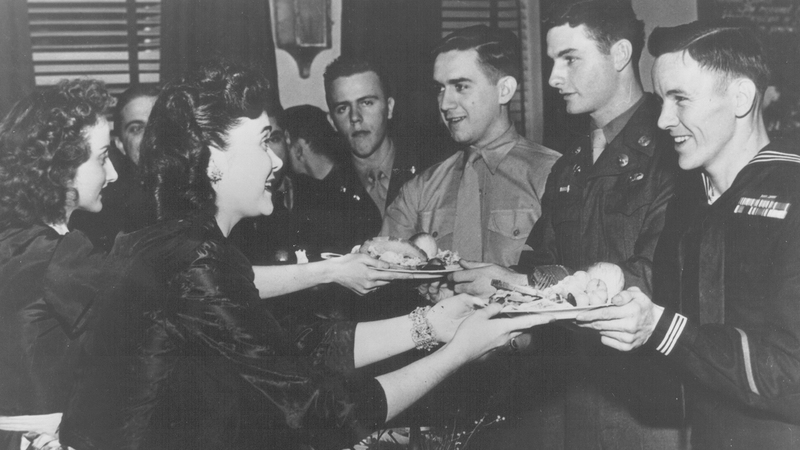 Whether troops were stuck at a railroad depot in Sayre, Pennsylvania—where legend has it USO volunteers once fed 30,000 troops in transit in one day—or a small town in the Midwest ill-equipped to host them, they knew they’d find hospitality from a legion of USO junior hostesses. While the organization successfully played up the junior hostesses’ youth and femininity in its early marketing campaigns, USO clubs were also home to practical endeavors. Hostesses who’d spend their nights jitterbugging with troops also mended their uniforms, helped them write letters home and snagged them drinks, donuts and sandwiches. And when troops couldn’t get to the USO, the USO found a way to get to them. The first Mobile USOs were rolling around the continental United States long before D-Day. These trucks were packed with entertainment options and dispatched to remote training sites so troops could enjoy their downtime in the field—much like the Mobile USOs of today. Mobile USOs started circulating in the lower 48 states in 1942. They consisted of trucks with generators, screens and projectors to show film reels and many were equipped with a public address system, turntables and records, sports gear, board games, books and snacks. The trucks had as much media as they could pack including film projectors and screens, public address systems, records and turntables, all powered by generators. They also brought board games, sports equipment, books and snacks. And with the staple of every USO being the Saturday night dance, nearby USOs coordinated junior hostesses and chaperones to go out and meet the Mobile USOs for events. While the dances and hostesses were the constant draw in small-town America, USO Camp Shows were huge draws abroad. The entertainment arm of the USO became so large so quickly that it was split into a separate entity called USO Camp Shows, Inc. Headed by William Morris Agency chairman Abe Lastfogel, many major entertainers of the day signed up for tours overseas and even shifts at the Stage Door Canteen in New York City and the Hollywood Canteen in Los Angeles. From 1941-47, more than 7,000 entertainers performed more than 425,000 USO Camp Shows for troops. By comparison, the USO brought 94 entertainers to roughly 275,000 troops last year. The tours were broken into four circuits. The Foxhole Circuit, the most celebrated, brought entertainers to the troops fighting on the front lines. The Victory Circuit was about big productions. It traveled around stateside bases that had facilities large enough to host events like Broadway musicals. The Blue Circuit was for vaudeville acts and headlining comedians. And the Hospital Circuit, which wasn’t launched until 1944, entertained 850,000 injured troops that year alone, many at their bedsides. Many of the top-line entertainers of the 1940s toured for the USO without pay. 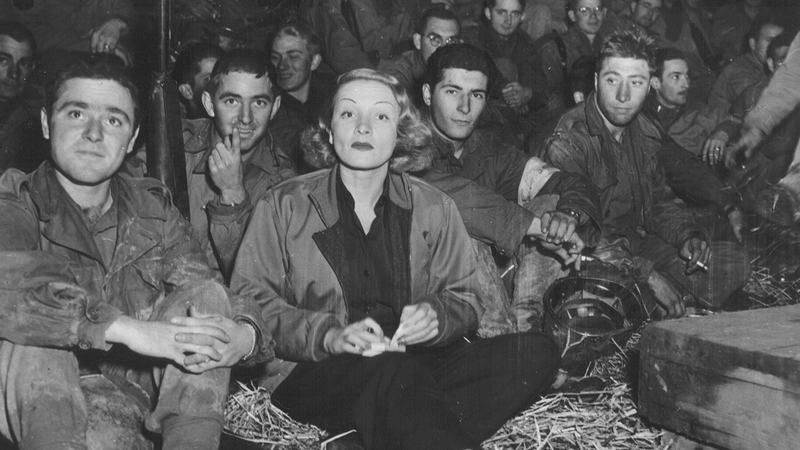 While the likes of Hope, Marlene Dietrich, Bing Crosby, The Andrews Sisters and dozens of others playing for troops overseas, even more entertainers were performing and serving at the USO Canteens. Troops routinely stopped by New York City’s Stage Door Canteen to watch the stars of Broadway shows entertain them on stage and serve them donuts and drinks. CBS broadcasted a radio show from the canteen on Thursdays, Irving Berlin wrote the song, I Left My Heart at the Stage Door Canteen about the location and the 1943 movie Stage Door Canteen was loosely based on events that happened there, too. Other entertainers pulled shifts at Stage Door Canteens in big cities like Boston, Philadelphia, Cleveland, San Francisco and London. The Hollywood Canteen, which also had an eponymous movie made about it in 1944, was famous for having stars working in every aspect of the operation—in some cases pulling anonymous kitchen shifts. That discharge didn’t last long. Less than a year after he’d disbanded it, an advisory committee told Truman he needed to either revive the organization or commission a new entity to do what the USO had done for troops during World War II. On January 1, 1949, the USO resumed operations. –Eric Brandner is the USO’s director of story development. This story originally appeared in the Fall 2015 issue of On Patrol, the magazine of the USO.